JDA is all set to acquire i2 Technologies for approximately USD $346 million – the huger for scale is relentless, it seems but whether or not it succeeds is a different matter altogether. IndustryWeek reports on investment prioritization for manufacturing operations software and how it varies across different industry segments in a recent article titled – Different Priorities. 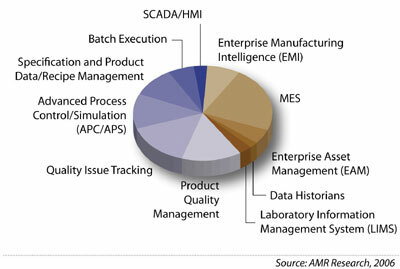 # In chemicals, 28% of the manufacturing budget will be applied to advanced process control and simulation. # In aerospace and defense, 50% of the manufacturing budget will be applied to quality management systems. # In pharmaceuticals, almost 45% of the manufacturing spending will be applied to quality management (if LIMS is included), 20% on recipe/formula/specification management and 20% on enterprise manufacturing intelligence (EMI). # Automotive, high-tech and industrial products are prioritizing MES (29%, 32% and 35% respectively). # The consumer products industry is spending the largest share of any industry’s manufacturing budget on EAM, at 16%. As the report highlights, pharmaceuticals, aerospace and defense are trending towards quality management systems which is a sizeable market area to address if you were a provider of software systems. So the obvious question then is what are the quality management systems out there? Further, is quality management a COTS (Commercial Off-the Shelf Software) type of solution or something more substantial (and messy as well). The second category of interest is MES (Manufacturing Execution Systems) which garners significant interest across the segments of automotive, high-tech and industrial products. The surprising (or perhaps, not so surprising) thing about MES is highlighted in this article here. What happened here – manufacturers are realizing that their ability to effectively measure and manage the performance of their manufacturing assets hasn’t proportionately improved? Is it simply that knowing what is happening doesn’t mean that you know what to do about it? Or is it just an informational glut of too many metrics that have not been pulled together into a coherent manufacturing execution philosophy? The last category of interest is the advanced process control and simulation software as applicable to chemicals industrial segment. One thing stands out in all these major categories of investment interest i.e. finding the silver bullet for business execution. These systems are central to the functioning of the business i.e. they are core systems. Even in the quality management systems of interest in the first category, I would argue that it is a core function of the firm. From this, there is an indication that the promises of ERP or similar systems have not actually panned out in actuality. That’s good to know because the need is still there.